This document goes over how to follow Glass style and implement common UI best practices when using the GDK. To apply the Glass theme, don't declare a theme in your Android Manifest. Note: ADT and Android Studio usually assign a theme automatically, even if you specify no theme, so remove the android:theme property from your manifest after creating a project. 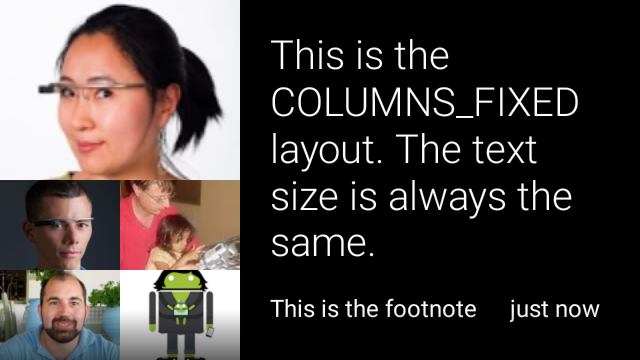 See the Android developer guide on Styles and Themes for more information about creating themes. The CardBuilder class creates well-formed cards given a set of properties. Use the layouts provided by CardBuilder.Layout whenever possible so that your content looks and feels like other content on Glass. Create an instance of CardBuilder, giving it your desired layout from CardBuilder.Layout. 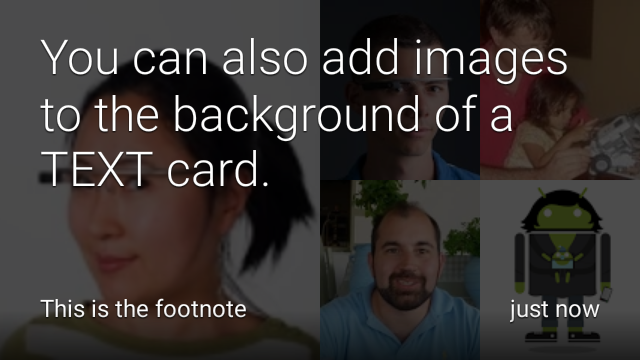 Set properties of the card, such as the text, footnote, and timestamp. Call CardBuilder.getView() to convert the card to an Android View, or CardBuilder.getRemoteViews() to convert it to a RemoteViews object. 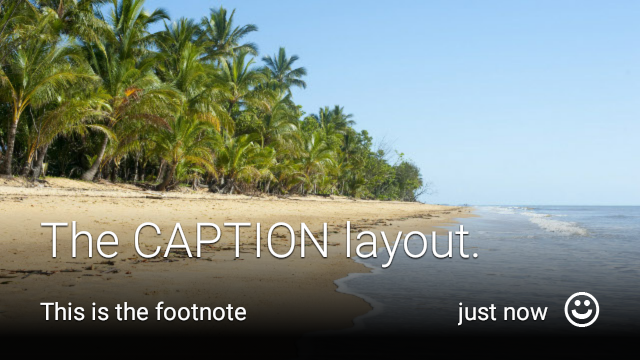 Use the View in your activities, layouts, or in a CardScrollView, or use the RemoteViews in a LiveCard. Many of the layouts provided by CardBuilder support the common user interface features described below. See the documentation of the individual layouts in CardBuilder.Layout for a list of the features supported by each type of card. 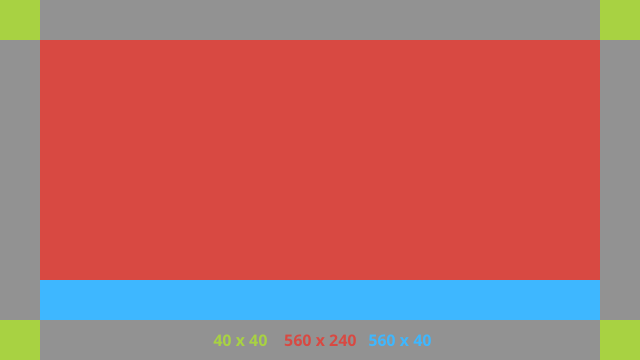 The attribution icon is an optional 36 × 36 pixel icon that appears on the bottom-right corner of a card and to the right of the timestamp. Set this icon by calling CardBuilder.setAttributionIcon() to identify your application, especially on live cards so a user can quickly glance and see the source of the information on that card. The stack indicator, controlled by CardBuilder.showStackIndicator(), is a corner fold that appears on the top-right corner of a card. Use this as a visual indicator that your card represents a bundle of other cards that the user can tap directly into. The following examples show the layouts that are available using the CardBuilder. 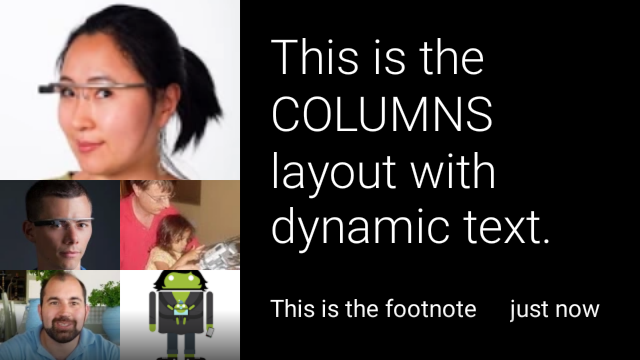 Note: Layouts with full-bleed images can have up to eight images in the mosaic, while column layouts can only have up to five. The CardBuilder.Layout.TEXT layout shows full-bleed text with an optional image mosaic in the background. The text dynamically resizes to best fit the available space. CardBuilder.Layout.TEXT_FIXED is similar but fixes its text to a smaller size. The CardBuilder.Layout.COLUMNS layout shows an image mosaic or icon on the left side of the card and text on the right side. The text is dynamically sized to best fit the available space. To keep the text size fixed, use CardBuilder.Layout.COLUMNS_FIXED. The CardBuilder.Layout.CAPTION layout has an image mosaic in the background and brief caption text aligned at the bottom of the card. An icon can also be placed next to the caption to represent, for example, the identity of a person associated with the card's content. 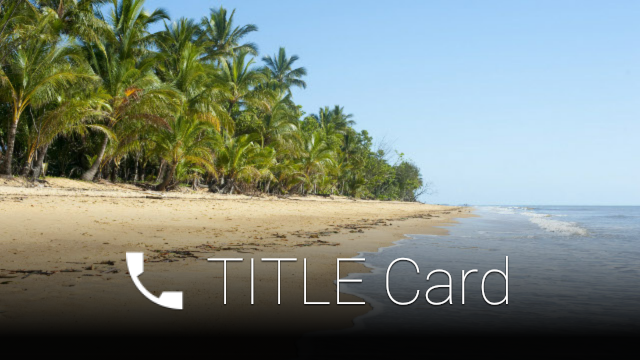 The CardBuilder.Layout.TITLE layout has an image mosaic in the background with a centered title and optional icon on the bottom of the card. This layout is often used to represent contacts or share targets. 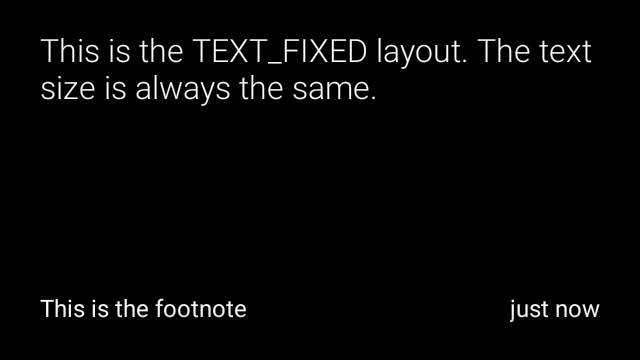 Footnote and timestamp are not supported on this layout. 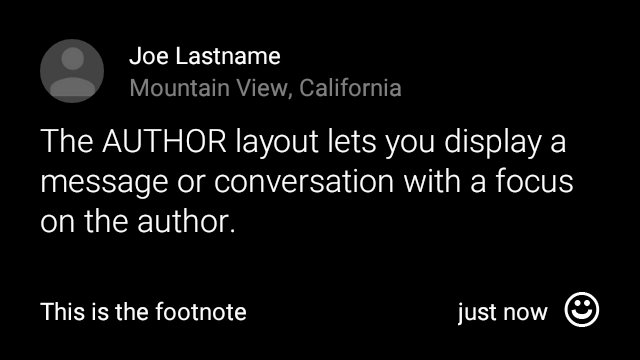 Use the CardBuilder.Layout.AUTHOR layout to display a message or conversation where the focus is on the author. It supports an image mosaic in the background, an icon used as the author's avatar, and a heading and subheading where you can list identifying information. .setText("The AUTHOR layout lets you display a message or conversation "
The CardBuilder.Layout.MENU layout looks like a standard Glass menu. 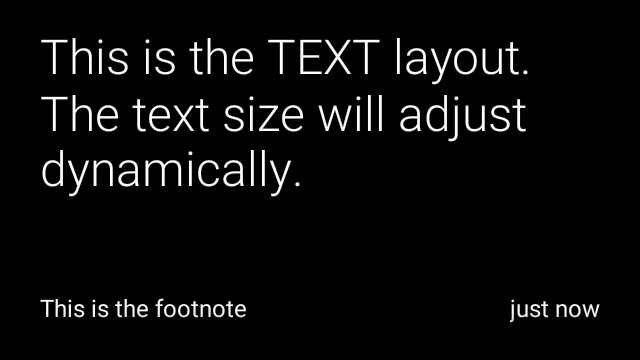 It has a centered icon and title and an optional footnote. Use this layout for confirmation screens (transitioning from "Deleting" to "Deleted" after the user selects a menu item, for example). 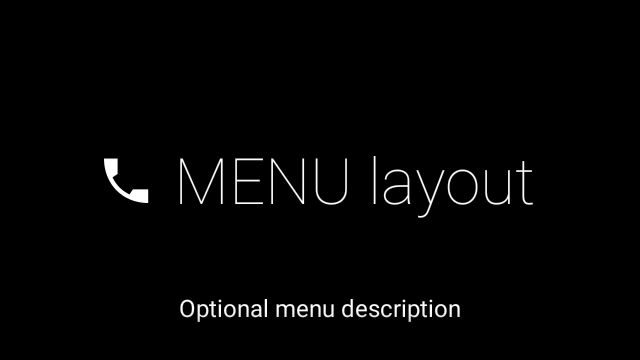 If you need a real menu, you should use a standard options menu instead. The CardBuilder.Layout.EMBED_INSIDE layout embeds a custom layout XML of your own design into the standard Glass card template. This lets you design a custom UI for your application but still have correct placement of a card's footnote, timestamp, attribution icon, and stack indicator if they are needed. After calling CardBuilder.getView(), use findViewById() on the result to access the views inside your embedded layout. Likewise, if you call CardBuilder.getRemoteViews(), you can manipulate your embedded layout's views by passing their IDs directly into the RemoteViews setter methods. For a more detailed example, see the GitHub ApiDemo project. The CardBuilder.Layout.ALERT layout contains a large centered icon with a primary message and footnote. Use this layout in a Dialog to show an important informational message, warning, or error in your Glassware. 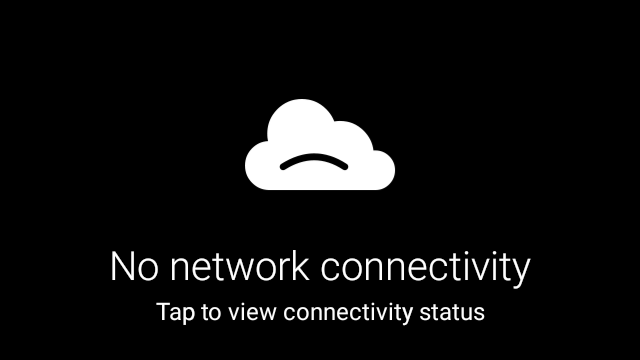 Note: Use ic_cloud_sad_150.png for network connectivity alerts and ic_warning_150.png for generic warnings. Download these assets from Glass menu icons. Create a class that extends Dialog. Create the card using CardBuilder with the CardBuilder.Layout.ALERT layout and then set the content view with this card. (Optional) Create a GestureDetector to handle user gestures on this card. 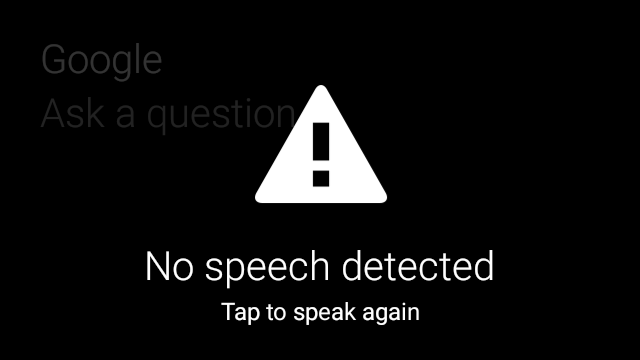 Note: The swipe down gesture on Dialog objects automatically plays the appropriate sound: Sounds.DISMISSED if the dialog is cancelable, or Sounds.DISALLOWED if it is not. * onClickListener if one is provided. // the index passed to onClick is always 0. (Optional) In your activity, implement an OnClickListener to handle any additional flows when the user taps. For more information on starting settings activities like WiFi, see Starting settings. Call the AlertDialog constructor to display the alert card. Here are two basic card layouts that you can use if the CardBuilder class does not meet your needs. This layout defines the standard padding and footer for a card. Put your own views in the empty RelativeLayout. 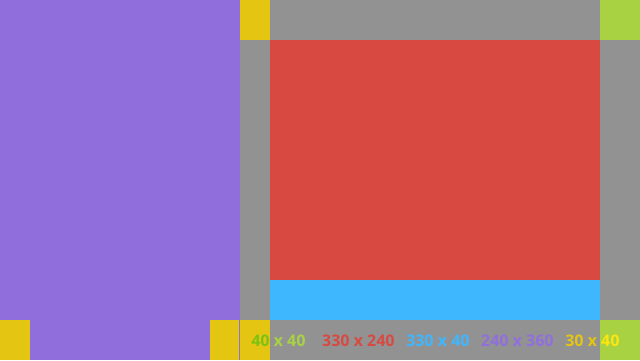 This defines a 240px left column and 400px right column in the form of two RelativeLayouts that you can put your views into. will be ellipsized with a 40px margin between it and the timestamp. Use this file in conjunction with the previous layouts or your own layouts to to adhere to standard Glass style. Create this file as res/values/dimens.xml in your Android project.